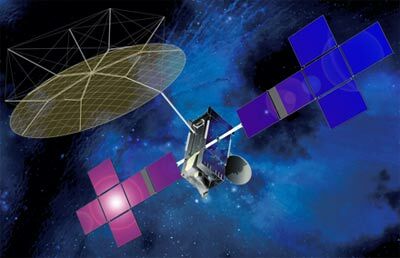 Space Systems/Loral (SS/L) announced in 2005 that it has recently signed a contract with ICO Satellite Management, LLC for the design and construction of a geostationary Mobile Satellite Services (MSS) satellite that, together with an Ancillary Terrestrial Component (ATC), will be capable of providing mobile voice and data communications throughout the United States. The ICO G1 satellite belongs to the 2 GHz mobile systems, which are driving a growing segment of today's satellite manufacturing industry. ICO's G1 satellite is based on SS/L's space-proven SSL-1300 platform, which has an excellent record of reliable operation. Its high efficiency solar arrays and lightweight batteries are designed to provide uninterrupted electrical power. ICO is one of two companies awarded licenses by the FCC to provide satellite-based communications services with ATC technology in the 2 GHz frequency band. With its SS/L constructed geostationary satellite and ATC, ICO will provide next generation mobile voice and data services, providing complete coverage regardless of the user's location. It appears, that this new geostationary satellite will replace the earlier plan for a MEO constellation of 12 ICO satellites, of which only one has been successfully put into orbit. The company changed its name to DBSD North America, Inc. in May, 2009 and the satellite was in turn renamed DBSD G1. Dish Network Corporation (EchoStar) acquired the reorganized DBSD North America, Inc. in March 2012 and renamed the satellite EchoStar G1.